Andy Rooney signed off of 60 Minutes just a month ago. Here’s to you Andy Rooney. When someone finally invents the ap you’ll be closing out a Sunday broadcast of 60 Minutes one more time. “Heaven is not all that’s it cracked up to be” you’ll tell us leaning into the camera with that one on one touch you mastered over all those decades. “Sure it was great to finally meet God and get escorted to the VIP section. The angels are terrific. Very attractive and polite. Have met some interesting people. Covered some of them over the years. Hooked up with Ike again. He was always nice to talk with but a little dull if you ask me. “Let’s face it. Eternity is a heck of a long time. Even under the best of circumstances. Like what to do on Saturday night a million years from now. In December. In a lot of ways Andy was a lucky guy. To come up with something short and sweet once a week for a couple of minutes. With that snarky, curmudgeonly edge to it. Always made us laugh, or at least smile and think. It got him into trouble now and then. If it didn’t he wouldn’t be doing his job. That’s what columnists and commentators are supposed to do. It isn’t like being a politician and hoping everyone likes you. The best journalists have lots of acquaintances but not many friends. Mostly they hang out and drink with colleagues unless they quit and join AA or get religion. Amazing. 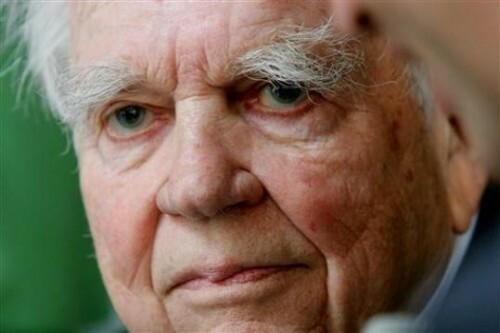 "A Few Minutes With Andy Rooney.” He died Friday night, according to CBS, only a month after delivering his 1,097th and final televised commentary. Having the chance to say goodnight for the last time to millions of your nearest and dearest friends. We should all be so lucky. Reaching 92 with all those great memories. It would have made my day. He would have shrugged, put his head down, and walked away. It would have made me feel bad. I hate rejection. That last broadcast made me sad. The head shot was fine. Same old Andy with those bushy eyebrows and drooping lids. But there were a couple of long shots of him walking around CBS. He looked so old and hunched over. Like people get. The body was giving out but the mind and spirit were still there. Sure there are a lot of social critics out there. Particularly now with social media everyone has their two cents to post. Andy Rooney did it with what the late George Frazier called duende. It means more or less been there, done that. There ain’t much of that around anymore. "very nice piece on Andy Rooney.we don't see much of his compact wit anymore." "For a while I banked at the same Chase branch Andy did. His checks were always bouncing, and then he would report, on air, that Chase had bounced his check for $5.40 payable to Staples. The manager finally got the matter placed before the Chase CEO and Andy's checks no longer bounced. Andy must have loved the fuss. " "Sunday night just ain't the same. "